They are loyal intelligent and really protected for their master they are very good for hunting which always lead them off. Don’t let them alone to an open area because this breed really can make difficulties while this breed allows moving alone and independently so it would be good to kept them in a covered yard. 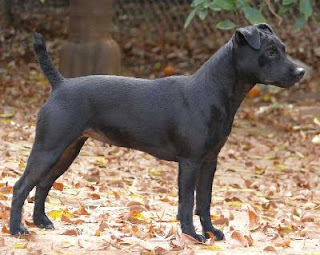 The patterdale is mostly seen in black color and has a short and broken coat. their coat is always remain coasre. They are available in in different types. This terrier is quit difficult to train they need a good and polite trainer. This breed of dog requires regular exercise and should not remain without a fenced yard. if this breed is left under yard without training so they can dig underneath the fence, the fence should be dig under ground and high enough that they can not go out form the fence. their is no hard work is needed while their grooming their is a normal grooming is needed to keep them in a good shape. brushing should be done with a bristle or rubber brush which will remove the dead and excess hair this breed is love to dig so be sure to clean his feet before coming inside. This is generally a very healthy dog breed with no known health problems and dog diseases, The average lifespan of this breed of dogs is between 11 to 13 years.